But hope is not lost! The Royal Academy Scientists are working round the clock! Sailors are delivering vaccines to ports all over, and Railwaymen are laying down tracks so they can be delivered faster to their destinations. Will you be able to save the populace in time, or will the disease be overrun before you can find a treatment? In the co-operative game Pandemic Iberia, you and your friends will be working together to find treatments for 4 diseases before either time runs out or the diseases have spread too far to be stopped. If you have already played the original Pandemic, you will find a similar experience with a few added twists, and if you have never played Pandemic (or any other co-operative (or co-op for short), you will find a challenging yet exciting game and perhaps a little history lesson as well. Inside the box you will find a game board, 7 pawns + role cards for each pawn, 69 player cards, 48 infection cards, 5 reference cards, 5 challenge cards, 96 disease cubes (24 in each colour), 14 water purification tokens, 20 railway tokens, 4 hospitals and numerous markers + a beautiful art book. I gotta say… wow the components are gorgeous and the artwork is top notch. This game is a limited collectors edition, which means they are only making it for a year and never re-printing it again. And the quality of every component is stunning. The cards are not only beautiful but very well laid out. The tokens for tracking are gorgeous painted wood, and the wooden microscopes are a nice touch. The map is a stunning representation of the Iberian peninsula (if you need a geographical reference, thats Portugal and Spain) and the art book that comes with it is amazing. One little thing that bothers me is that they went above and beyond on every component except the players pawns. They’re the same pawns you get in the regular Pandemic game. For a collectors edition, I’m sure they could have made the pawns a little nicer. They’re functional and look good, but they just feel out of place in a game like this. I’m not going to go into too much detail for how to set it up because the instructions show a detailed setup and it’s very informative and easy. I’ll also touch on the rules but won’t explain everything. And if anyone has ever played the original Pandemic, it is very similar. But I will touch on some important points. Everyone will be given a role in the game. The roles will give each player a bonus, whether it’s doubling an action or letting them take actions without the use of cards. These roles are extremely important and you will coordinate your plans around them. It’s also nice that they didn’t use most of the roles from Pandemic and instead came up with quite a few new ones that work very well and are faithful to the time period. Second, you can select the difficulty of the game by how many epidemic cards you put in the deck. The more there are the harder the game will be. But there will also be event cards in the game, which will be helpful to you during the game and make life easier. Before you begin, you will shuffle in the event cards into the player card deck (the more players the more cards) and each player will be dealt their starting hand (the more players, the less cards you start with). Each card will depict a city on the board. Choose one of them and place your pawn on that city, that will be your starting point. Then, depending on how hard you want the game, you will take the player deck and create as many piles as there are epidemic cards (4-6 piles) and shuffle them in each pile, and then stack them all together. Then… you will draw cards from the infection pile and infect the board before you even begin the game. Isn’t that lovely? Now we are ready to save the peninsula! Build a hospital. If you have the card in your hand of the city you are in, you can discard it to build a hospital there. It must be the matching colour of the city. Hospitals are essential for researching diseases. Treat a disease. Remove a disease cube. Share knowledge aka give or take cards. If you and another player are in the same city and one of you has that city card, you can either give it on your turn, or your teammate can take it from you (as long as you both agree). Purify water. Discard a card to add purification tokens to a adjacent region you are in. They will prevent diseases from spreading as infections happen. Research a disease. If you are in a city with a hospital and have 5 matching cards of that colour, you can discard them to research that disease. After you complete 4 actions, you will end your turn by drawing cards from the infection pile and adding disease cubes on the board. Then, you will draw 2 cards into your hand. And you have to remember… you can only have max 7 cards in your hand at once, so if you are over that you must discard any extras! If you draw an epidemic card… well… thats when the diseases really start to spread around. And the discard pile of the infection deck get re-shuffled and put back on top… meaning the cities that are already infected are just gonna get worse if you don’t act fast! Time runs out. If the deck doesn’t have enough cards to draw 2.. well, you’ve run out of time and the game is over. The disease has spread too far. If there are no more cubes of a colour, then that disease is out of control and you have lost the game. Massive outbreaks. If there are 3 cubes of the same colour, and you would have to place a fourth… well, thats when an outbreak occurs and you have to place a disease cube in every adjacent city and move the outbreak track up. If you move it too much, you will hit the end of the track and the game is over! But… research all 4 diseases before any of that happens and you win the game! What do you do next? Play again… the game also comes with 2 historical scenarios that alter the gameplay conditions. Or make it harder by adding more epidemic cards. When I first played Pandemic, I fell in love with it. It was my first co-operative game, and I’ve purchased many since but it is still one of my favourites. So… comparing it to that, how does this one stack up? First of all, I love the addition of the railroads. I love train games (I’m sure I’ll get to reviewing one soon on here), and I love building things, so laying tracks is really fun, and useful! Laying down a network of tracks (especially easy if you have the railwayman role) will make moving across the board fast and won’t take up precious actions. I also love the new roles. They really fit in with the time period and are really useful if utilized correctly. 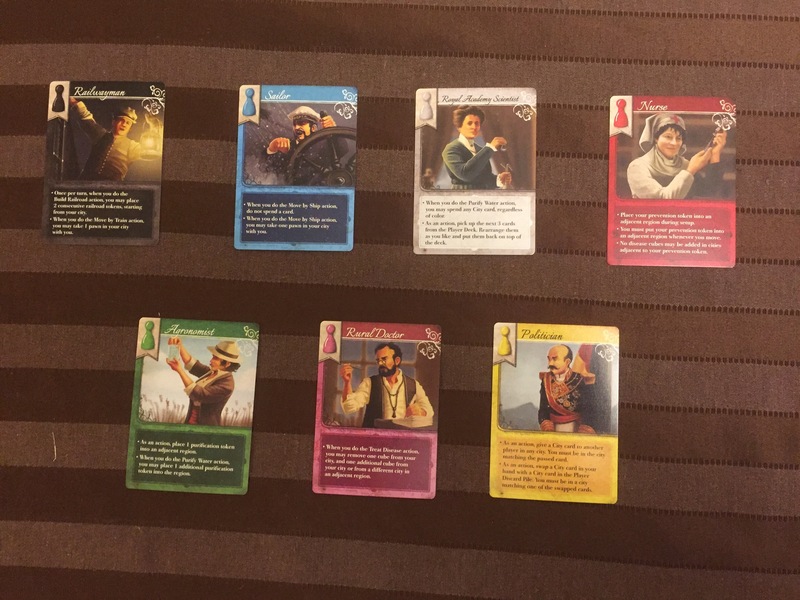 Also, the game comes with a plethora of event cards, and not all are used during the game so that adds variety to the deck. And one thing this has over Pandemic is it plays up to 5 players instead of 4 (I know Pandemic: On the Brink adds a 5th player, but that player is working against the rest and changes the gameplay so I’m not counting it). I haven’t played a 5 player game yet, so I don’t know how it works but its available there, so thats a big bonus. The water purification is a nice addition that is basically a one time use prevention. Don’t have the actions to clear a city of cubes but you know its coming up in the infection pile soon because of an epidemic? Put some water tokens down and when that city gets drawn, remove a water token instead of placing another cube and causing a massive outbreak. Which does bring me to something I noticed. This game seemed a little easier than when I first played Pandemic. We easily won our first game, where in Pandemic it took us a few games for our first victory. Maybe it’s cause we are more experienced now, and we did land some pretty sweet roles, but still felt more forgiving. Which isn’t always a bad thing. So the questions come up. “I own Pandemic… should I get this one too?” “I don’t own Pandemic… should I buy the original or this one?”. I’ll start of by saying this. After playing this… it’s actually crossed my mind on whether I should get rid of my original Pandemic? I Really like this version of Pandemic. It’s definitely much better artwork, and I love the ability to build tracks, and it does come with 2 variants which keeps gameplay exciting and fresh. 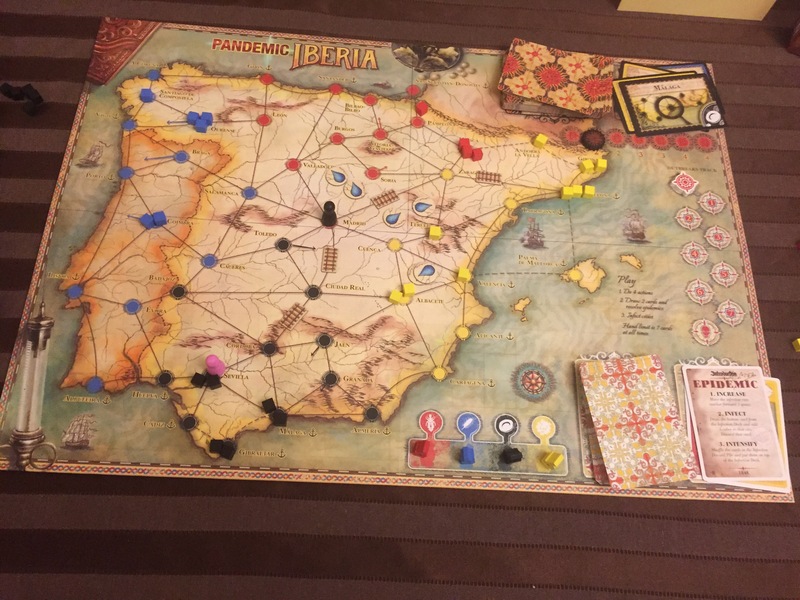 But… if you like adding expansions to your game, Pandemic has 3 at the moment and will potentially be getting more; Pandemic Iberia will never get one as it is a limited collectors edition. So my final thoughts: If you love Pandemic and it’s your favourite game, if you’ve never played a co-op and would love to try one, if you’re a history buff and love great artwork, if you’re a collector and like limited editions, or if your game group has 5 players, this is a great addition to your game collection. It’s definitely surpassed the base game for me, and I look forward to playing it again. There are still copies lying around… get yours before there are no more. For a limited collectors edition… they really couldn’t have upgraded the pawns? The pieces that you use the most? My grandson and I used to love to play the original Pandemic game!